De Angelis Ark: Mary Jane Watson is black! So what?! Mary Jane Watson is black! So what?! Zendaya will be playing Mary Jane Watson. I've been reading a lot of BS about Zendaya, who's possibly playing Mary Jane Watson, Peter Parker's love interest, in the upcoming Marvel's Spider-man: Homecoming. A lot of friends come to me to ask my opinion about this "unusual" cast choice, because they know I'm into comic books since I was 8 years old and I love Spider-man. My answer is: I love it! I really do! I really really really really really really love it! Let's get one thing straight: Mary Jane is white in the comic books. We know it! But it couldn't be any different back in 1965 when she was created. At that time, it was not seen with good eyes a white man dating a black girl. So, it explains why Peter Parker, born and raised in an ongoing diverse New York, only dated white girls. Can you name any important black female characters at that time? Neither do I! Let's face it: Comic Books were not always a place that embraced diversity. Justice League and Avengers, for example, were depicted with a majority of white characters. I mean, don't get me wrong, I love those characters as well, but I'm happy with the new world! Comics accepting Black, Latins, Asians, Muslins and all other types of characters was something I was always looking for. 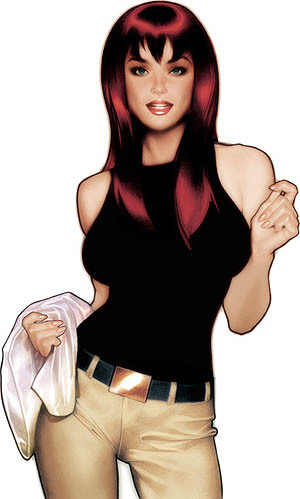 The Original Mary Jane Watson. TV and Cinema were great gateways for diversity. It embraced non-white actors playing famous characters. Just to name a few recent examples: Samuel L. Jackson playing Nick Fury for Marvel Cinematic Universe and Candice Patton as Iris West in Flash were very well accepted by critics and helped people see we lacked other races in the Super-heroes Universe. And good to see it's being fixed little by little! When Zendaya was announced in the Homecoming movie as a "minor" character named Michelle, I knew they were bluffing. In fact, I was expecting her to play Gwen Stacy, but I think Emma Watson's portray of Peter's first love was still a recent memory a lot of us love, whereas Kirsten Dunst's Mary Jane was something a lot of us would love to forget. Well done, Marvel Studios!!! Welcome, Zendaya! Be the best Mary Jane you can be. We know you've got what it takes to do a great job. You may experience some hate, some mean tweets, but, you know what, the best way for you to give a straight answer is by being great. And you, guys, don't bother spreading your hate on my post!!! Love, on the other hand, is pretty much appreciated!